For Immediate Release! Halloween Good Night is HERE! 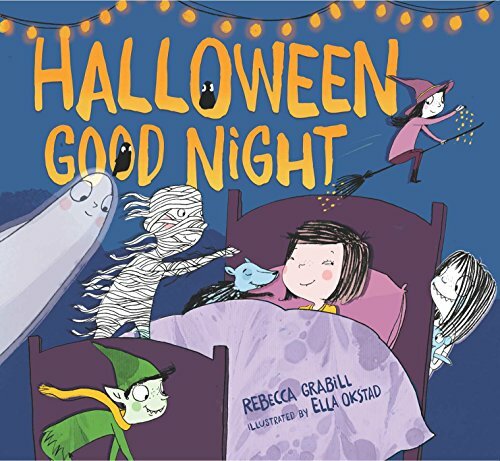 The newly released title Halloween Good Night by Rebecca Grabill teaches number literacy to the preschool set in this imaginative, poetic Halloween tale. About the Author: Rebecca Grabill lives and writes in the Michigan wilds with her spouse and five children, two kitties, multiple chickens, and the occasional ghost. Halloween Good Night (Atheneum, ’17) is her first picture book, soon to be followed by Violet and the Woof (Katherine Tegan Books, ’18). Rhyming text and tender illustrations make a satisfying and surprising story suitable for bedtime. No nightmares allowed in Grabill’s land of globsters and goblins! Many traditional Halloween monsters lurk between the pages—vampires, werewolves, mummies—with a few lesser known, like the mischievous bogart! Added to the Halloween fun, is number literacy as the reader counts from one globster to two wood imps and up to ten then down again as the monsters return to bed. Contact Rebecca: through her website www.rebeccagrabill.com or follow her on Twitter: @rebeccagrabill. Email her directly at rebeccagrabill@gmail.com Review copies can be obtained from Simon & Schuster, Atheneum Books for Young Readers, and books are available for order on Amazon. Would you rather see the Official Press Release from Simon and Schuster? Of course you would! Here it is, for all your sharing enjoyment! Download the PDF press release here.